wed the sea with rings. "A Toccata of Galuppi's" R.B. At Venice by the sea. "A Tale of Villafranca" E.B.B. Red geraniums, ivy, and other flowers overflow from the balcony at the top of the Venice Window, suggesting the many window boxes brightening the buildings along the Grand Canal. 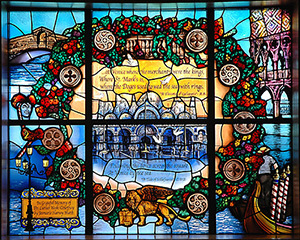 The stone-colored medallions interspersed among the wreath's flowers, representing the architectural riches of the city, were inspired by illustrations from a book by John Ruskin called The Stones of Venice (1851-53). Ruskin, a friend of the Brownings and a major art critic of the nineteenth century, is well-represented in the ABL collections. The winged Lion of Venice is depicted at the bottom of the wreath. In the central image of the window is St. Mark's Basilica, viewed from St. Mark's Square in the heart of Venice. White doves fly overhead, as mentioned in the EBB quotation. Because of the city's close proximity to the sea, blue is the predominate color in the window, but shades of pink, coral, red, orange, and green, suggesting colorful Venetian glass, are also reflected in this vibrant work of art. The Rialto Bridge or Ponte di Rialto, the oldest bridge spanning the Grand Canal, defines the upper left vignette. The present stone bridge, a single span, was completed in 1591 and replaced earlier wooden bridges. The bridge features an arched center portico with inclined ramps on either side and numerous small shops. Seen in the window's lower left corner is one of the traditional and imressive street lights illuminating the Grand Canal, and above are brightly decorated Carnivale masks, thus linking two elements of mysterious nighttime in Venice. A glimpse of the Doge's Palace or Palazzo Ducale from the Grand Canal is seen in the upper right corner. The home of the Doge, the elected ruler of the city, was the seat of the government of Venice for centuries and is a superb example of Venetial Gothic architecture. The Doge performed a yearly ceremony of wedding Venice to the sea by tossing a gold ring into the waves, as mentioned in the RB quotation. The prow of a gondola, a traditionally dressed gondolier in the distance, and several colorful mooring poles grace the shimmering water in the lower right corner.